This post will compare MREs to various other options. If you have been following the series of posts on MREs, you will have a good idea of their shelf life, which is 3 years at 80 degrees. In reality they are probably good for a longer period. 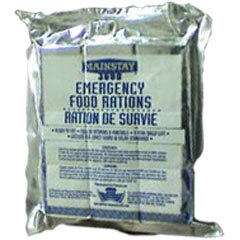 But in a real emergency I want to have the best rations available. To find out your food was bad would be a real problem. I have only compared the MREs against foods you would probably use in a bug out bag. In my opinion MREs should not be used for a prolonged period. If used for several days they are known to cause constipation and they are high in sugar content. Until recently I have carried MREs in my own bug out bag. They have some advantages, the packaging is extremely tough, they require no water or cooking and the taste is not bad. MREs provide about 1200 calories per meal. The accessory packages and candy are nice. New MREs run about $70 for 12 meals. The disadvantages are that they are bulky, have a short shelf life and cannot be left in the trunk of your car in the summer. My packs will now contain mountain house pouches. I know they have a reputation for being pricey, but consider the following. If you buy their “Just in Case” unit, you get 21 meals for $120.00. This works out about the same price as MREs per meal. The advantages are they are lighter, taste better and have a seven year shelf life. They hold up much better in the hot trunk of your car. Mountain house provides fewer calories than MREs about 1500 per day. The disadvantages are they require water to prepare. Where I live this is not a problem, lots of surface water. 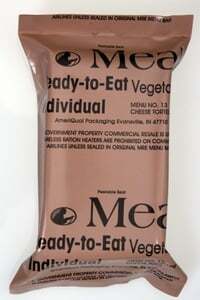 The packaging while strong will not take the damage of MRE packaging. For some the color of the packaging may be a problem. Unfortunately Mountain will not be available for a couple of months. AlpineAire is very similar to Mountain House. It is a good product with same advantages and disadvantages as Mountain House. I see nothing wrong with it except for the price, it costs more. They are a five gallon bucket that contains 56 one cup serving in 14 Mylar pouches. This is a combination of freeze dried and dehydrated foods. It weights 10lbs including the bucket; split between two packs for slightly less than 5lbs you would have seven days food for two people. This would provide you with four one cup servings a day at a cost of about $2.00 a meal. The Bug out Buckets provides about 1200 calories per day. Advantages, inexpensive, easy to prepare, if stored at 72 degrees has a 25 year shelf life and good tasting. Disadvantages are they require water to fix, contain TVP instead of meat, the packaging could be a problem, and it may not be enough food for some of you. 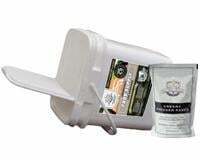 Bug out Buckets are currently available through Freezedryguy.com. They are really lifeboat rations. Three companies currently manufacture them, Mainstay, Datrex and S.O.S. They come in 2400 calorie and 3600 calorie packages. They come in two main flavors coconut and lemon. They break down easily into 400 calorie segments. Advantages They will last five years in the trunk of your car thought hot or cold weather. They are inexpensive, an are designed to provide a balanced minimum daily diet, light in weight, and do not make you thirsty. The bars are designed to provide you with 1200 calories a day. A 3600 calorie bar is smaller than one MRE. Disadvantages, not very filling, and have no variation in taste. But at a cost of about $7.00 for the 3600 calorie bar you can afford extra. With all the energy bars, breakfast bars and other packaged foods from the supermarket it is easy to make your own. The tuna that comes in a retort pouch is particularly good. The advantages to this, is that you can have the foods that you prefer, and the cost is at your discretion. The disadvantage is that the shelf life of the products will vary; items will have different sensitivities to heat. This is fine if this is a kit that you use regularly, but if it sits in the closet it is easy to forget to rotate the items. The MREs have more calories, but I want a week’s supply of food in my bug out bag that would be at least 14 MREs, they take a lot of room and are heavy. The reason I have chosen the Mountain House Just in Case unit is that my bag will sit in a corner most of the time. It provides me three meals a day. If I have to use my bug out bag, I want complete confidence in the food. In my small get home bag that stays in the trunk of my car all the time you will find Mainstay Emergency Bars, the trunk gets hot in the summer. I also always carry an assortment of energy bars (Millennium or Cliff bars) in my car. I spend a lot time in the country so these are convenient for everyday use. For me the Mountain House works well in my bug out bag, for you it may be something different. This entry was posted in food storage, Seventy-two hour kits and tagged dehydrated, emergency, emergency food bars, freeze dried, MFE's, Mountain House. Bookmark the permalink. 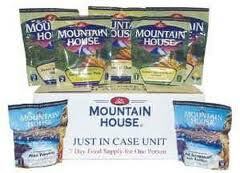 I have switched from MRE’s to Mountain House because of weight and shelf life. Good series of articles! I have a mix of the above selections as they all have strengths and weakness as well as powerbars, cliff bars etc. I rotate mine fats enough that they dont go bad. My bag is also my hunting, hiking etc bag and there is very little “new” in there and no food or water stays long. That is good, I do almost the same thing, The food in my bag is always changing. I understand about leaving MRE’s in your car during summer months.I know a couple of MRE’s can last the summer months and come fall I switch it out with another and eat it them up.Along with changing out season specific clothes. Since the dehydrated packs require water to prepare,I was wondering about a recommendation on a filter. I have a camelback to carry water and purification tabs (yuck) to disinfect but would like to buy a filter and the choices are overwhelming. In the southern U.S. the heat is our enemy with anything we keep in a car subject to rapid deterioration. I do have some MREs but weight and the heat issue concerns me and the dehydrated packs seem a reasonable approach. I currently keep my MRE’s in an old working freezer. They should last a while. I figure I can guage when things are getting bad and stage them.